I want to create a resource that helps teachers deliver lessons in British Sign Language (BSL) to KS2 pupils at primary schools. I was taught BSL at an early age and it has allowed me to converse with people, who have hearing difficulties, in personal, social and professional situations. Young people should be able to develop at least a basic competence in sign language in order to be able to communicate with anyone they encounter with a hearing impairment. Working with Fixers, I want my resource to target primary school teachers and parents in particular. But obviously, I want to reach out to the wider public as well. With the help of Fixers, I launched the sign language card game ‘Sign Me Up’. Below is some of the great feedback it has received from primary schools across the region. My Fixers card game, helping primary school pupils learn the basics in British Sign Language (BSL), has been trialled in several schools across Northern Ireland. The game will hopefully help teachers deliver lessons in a fun, interactive way - giving pupils insight into fingerspelling. We’re expecting to have the official launch in the first week of December when pupils will get the chance to try it out. 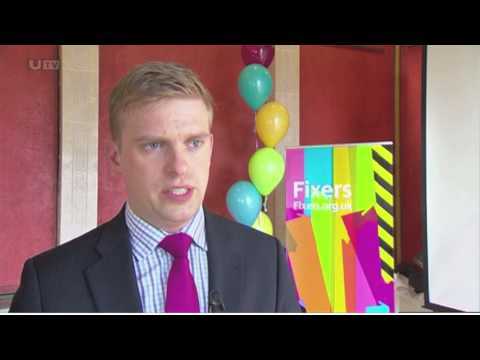 I attended the Fixers Northern Ireland Launch at Stormont, where I was able to share my Fixers campaign with a large audience which included MLAs.